Get more calls then brokers and operators !! Pretend to be very busy via random incoming message and/or phone call sounds. BUSY ME is intended as a prank but can be useful in situations when a ringing phone is needed. Adjust the DELAY between notifications from low delay = more sounds to high delay = less sounds. 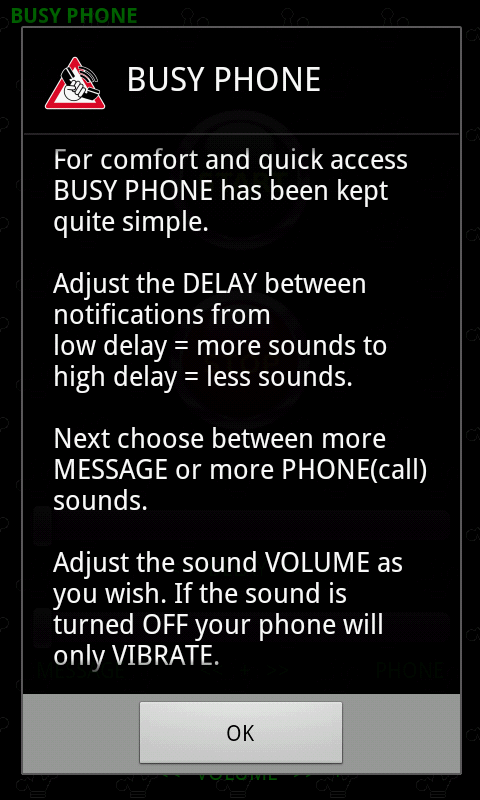 Next choose between more MESSAGE or more PHONE(call) sounds. Adjust the sound VOLUME as you wish. If the volume is turned OFF your phone will only VIBRATE. Tap the START button and let the magic happen. BUSY ME will show up in the action bar, running in the background even if your mobile device is sleeping. You can interrupt a phone call sound by merely dragging the action bar down and further quit the app tapping the STOP button in the main menu. This is a standalone application. Get this application for Android OS here.